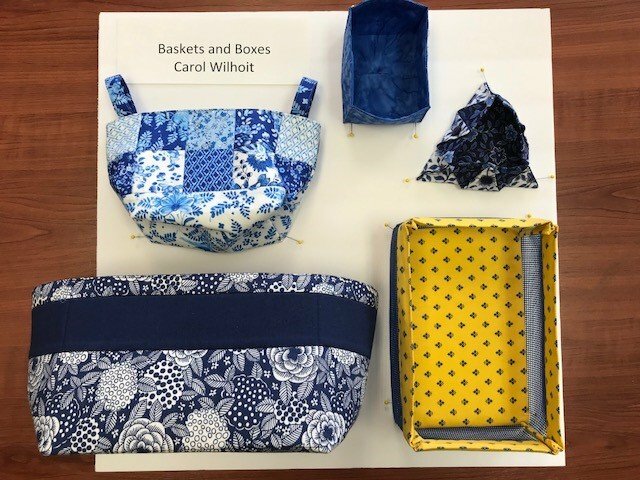 Use your quilting fabrics and tools to make five baskets and boxes that you can use to organize and brighten your space, wrap a gift, decorate your table, or share with a friend! The class projects are quick, fun and useful, ranging in size from a small basket for gathering scraps of thread or pins to a bin perfect for storing hand towels or fat quarters. They incorporate several types of stabilizers to add structure and support, so this is a good opportunity to use some different supplies and learn some new techniques. Use fabric from your stash or select some great new coordinates and make a matching set! By the end of the day, you'll have most of the baskets and boxes finished. Variations will be discussed, so you'll have lots of ideas for making more!